In recent years, the breeding of the buffalo has undergone significant structural changes that have led to greater sophistication of techniques. 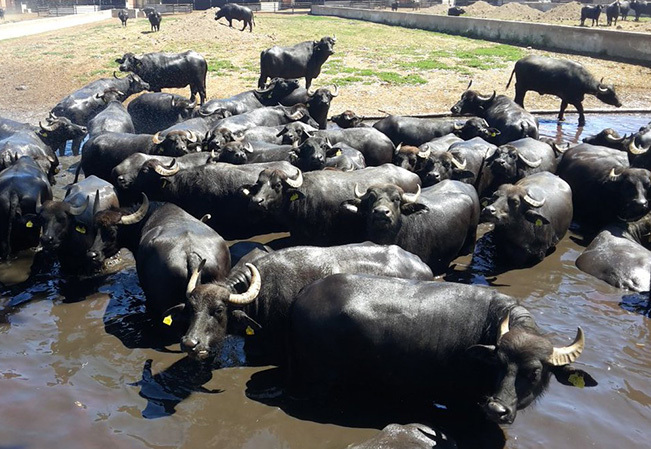 From extensive we have moved to a confined type of breeding, which, while limiting the space available to buffaloes, is able to better meet the needs throughout the various production phases. The Italian buffalo is almost certainly a rare example of a species whose evolution is inseparable from that of its product: the Mozzarella di Bufala Campana. 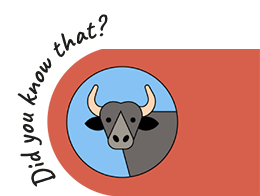 The milk of the buffalo has a different composition from that of other species used for the production of cheese. For example, compared to cow and sheep milk, it is richer in protein, fat and calcium. These chemical characteristics make it possible to obtain cheese-making yields equal to twice those usually obtained with cow’s milk. 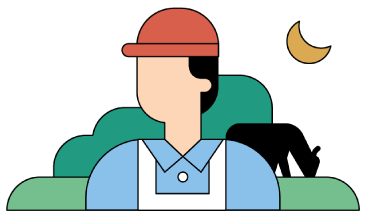 The milk produced on the farms is promptly transported to the production facilities, where, before starting the real process, it undergoes all the sanitary controls and the additional checks of the Disciplinary body. The buffalo weighs on average 5 quintals, it gives birth to only one calf (rare cases of twin birth) and it has a gestation that lasts about 10 months, with a lactation of 270 days. Coagulation is preceded by the addition to the milk – previously brought to a temperature between 33 and 39° C – of the starter whey (called cizza), coming from the same processing of the previous day. This addition activates the milk and makes it ready for immediate and subsequent coagulation, which is carried out in boilers or multipurpose steel vats, through the exclusive use of natural calf rennet. BREAKING AND MATURING THE CURD. After a few minutes the milk has coagulated due to the rennet, the cheesy lumps are broken with a tool called “spino”, which reduces them to just over the size of a walnut. From this moment the separation between the solid and the liquid phase of the milk (synaeresis) occurs. The liquid product, removed by withdrawal, is called “sweet whey”, while the solid product is called curd. 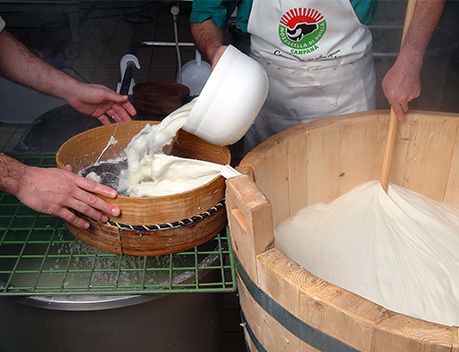 The latter is left to acidify under the whey until it is defined as “mature” or “ready” for the spinning by the cheese maker, by means of the spinning test that he personally performs. Forage, hay, feed or raw materials represent the basis of buffalo feeding. 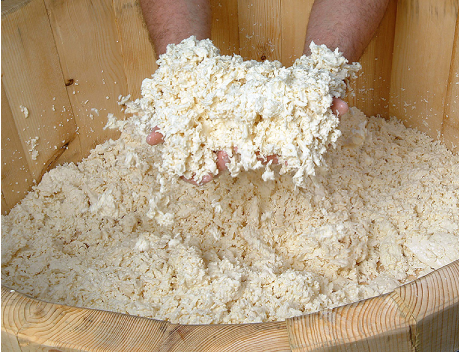 The “sweet whey” is the raw material from which the delicious Ricotta di Bufala Campana is obtained. 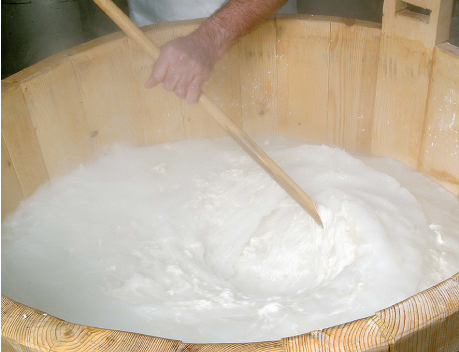 This empirical, yet absolutely reliable, test consists in adding boiling water to about half a kilo of shredded curd, which is blended until it melts and is then stretched by hand using a wooden stick: if it evenly stretches without breaking it is judged “ready” for the next spinning phase. The curd that reached the right degree of maturation is placed on tables where the whole residual whey is purged. 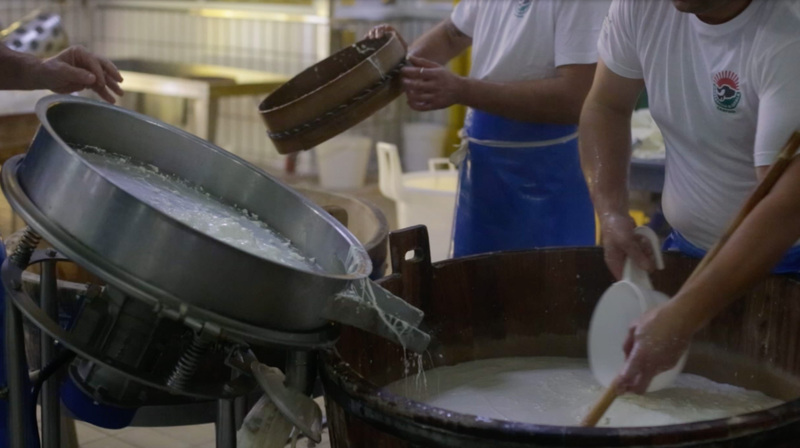 It is then cut into strips and placed in special containers, still today made of wood and called “mastelli”, where boiling water is added. 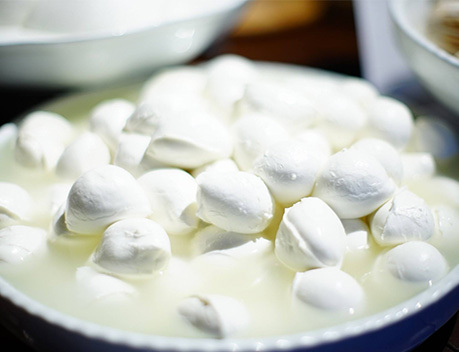 The contact between boiling water and curd causes the fusion of the mass, which is continuously raised and pulled until a single homogeneous body is obtained. 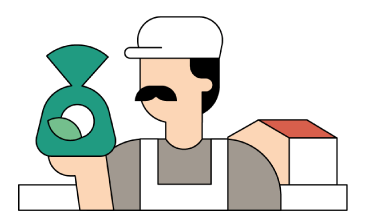 In the vast majority of dairies, a non negligible part of the shaping phase is carried out manually by the cheese maker and his collaborators. The remaining part involves the use of molding machines which produce pieces with a predetermined weight. The Mozzarella di Bufala Campana produced in this way is first left in tanks containing cold water to ensure a first important firming. It is then moved into other tanks also containing salt solutions and that complete the process by giving the product the right degree of flavour. The peculiar characteristics of buffalo milk, along with the handcrafted processing, are the basis of a success that cow’s milk, just because anonymous and worked with industrial techniques, has lost.